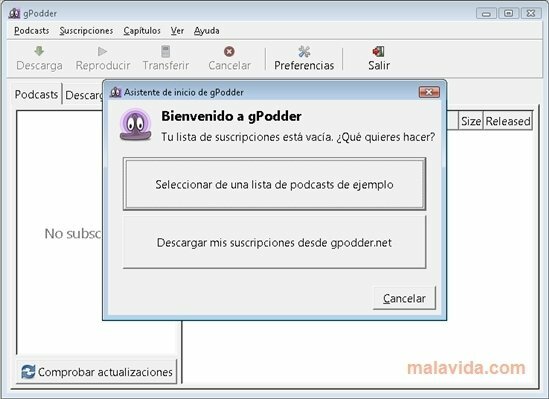 gPodder is the solution that many people were waiting for to be able to easily subscribe to podcasts. It you have an MP3 player that doesn't includes its own synchronisation software (or you don't like the one it includes) you will probably think that gPodder is an excellent solution to be able to obtain your podcasts directly. A podcast is an audio recording (or video, normally called videocast) that is halfway between a radio program and a blog. This means, in a podcast it is possible to listen to whatever its creator wants. And of course, there are those that are theme-based, personal, humorous,... Podcasts are usuallt associated to an RSS channel by means of which you can subscribe, channel that will be used by gPodder to download the latest chapters and synchronise them in the chosen player. gPodder doesn't forget about the social aspect of podcasts, allowing us to be able to search for the most popular ones, those that are similar to the ones that we normally listen to or even allowing us certain interaction with specific web portals like YouTube. Logically, podcasts can be heard on the PC by means of any integrated player, even though the most noteworthy use for gPodder is to synchronise them on any player, telephone or compatible device. gPodder is really complete, because it even manages the chapters that we have already listened to to delete them from the players, it allows us to share lists and recommendations via its web service and since it is multiplatform, it allow us to have all our gPodders synchronised.